You are going to love this Richmond Virginia Fall Wedding!! Meredith & Addison had the most beautiful backyard wedding. They were married on Meredith’s father’s property and their ceremony took place in front of a peach orchard! It was so beautiful! Their wedding was full of burgundy accents, perfect for fall. Meredith & Addison’s love story began in 2014. They met while working together at Hanover Parks & Recreation. The connection they have is incredible and the way Meredith makes Addison smile and laugh is so sweet! They are both teachers, Addison teaches elementary and Meredith teaches Math (both will be obvious as you look through the photos below!) Addison’s students wanted to be a party of their wedding. They each wrote/drew on cards to show what loves means to them, and they were displayed at the reception. So adorable!! They also have a sweet dog, Beaux! 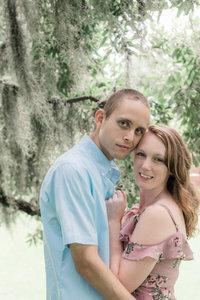 We loved meeting him at their engagement session! The vows they wrote to one another were so beautiful and sincere (you can hear them on their highlight film linked at the bottom)! So much emotion filled the air and their were not many dry eyes. The reception that followed was so much fun!! There was so much energy, we loved it! But first, the food was amazing! We highly recommend having your wedding catered by Garnish RVA! They had a bunch of speciality stations including one of our favorites, a pierogis bar! YUM! We also made a highlight film of their wedding day! We hope you enjoyed seeing this Richmond Virginia Fall Wedding! Leave a comment below with your favorite part of their day, or well wishes for the sweet couple! Interested in booking a wedding or portrait session with us? Head on over to our CONTACT page and we can start planning!